What was the inspiration for this dish? ¿Cuál fue la inspiración para preparar este platillo? 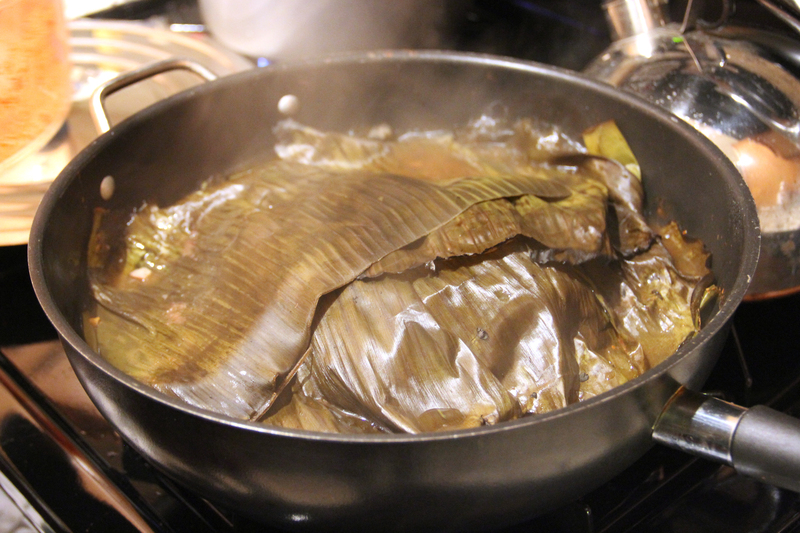 The traditional recipe is a Mayan dish called Cochinita Pibil, which is associated with the Day of the Dead. 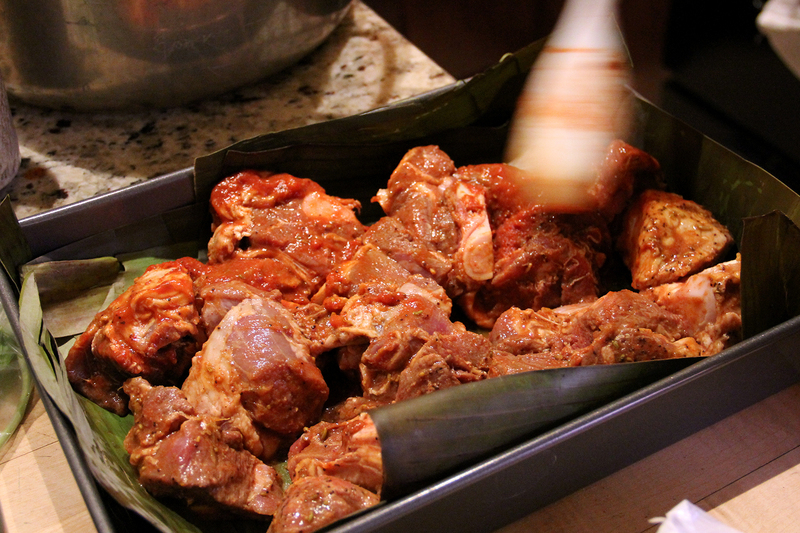 A young pig would be marinated in achiote, wrapped in banana leaves. and then cooked in the ground. My father used to follow my grandmother’s recipe. Although she was not from Yucatan, her recipe was delicious. Since my father and my grandmother died, cooking this dish is a sort of personal ritual for me, surrounded by my loved ones. La receta tradicional es la Cochinita Pibil, un platillo maya que está ligado al día de muertos. Originalmente se cava un hoyo en la tierra donde se cose un cerdito previamente marinado en achiote y envuelto en hoja de plátano. Mi padre solía preparar esta receta siguiendo las instrucciones de mi abuela, aunque ella no era de Yucatán, lo sabía hacer muy rico. Desde que mi padre y mi abuela murieron yo he cocinado este platillo como una especie de ritual personal en compañía de mi gente querida. What occasions did you and your family create/eat this dish? ¿En qué ocasión usted y su familia creaban y comían este platillo? The Cochinita Pibil recipe is a special dish that my father would prepare for my parties, when I would invite all my friends to eat, dance, and enjoy life. It is a delicious recipe and serves many guests, which makes many people full and happy. La Cochinita Pibil es una receta que mi padre preparaba en mis fiestas, cuando invitábamos a todos mis amigos a comer, baila y disfrutar de la vida. Es una receta deliciosa y muy rendidora, con la que puedes alimentar y hacer feliz a mucha gente. Does the context that you make this dish add to it? Or would it be the same dish if you made it for yourself? ¿El contexto cuando prepara el platillo agrega algo para usted? ¿Sería igual para usted si simplemente preparar el platillo para usted? 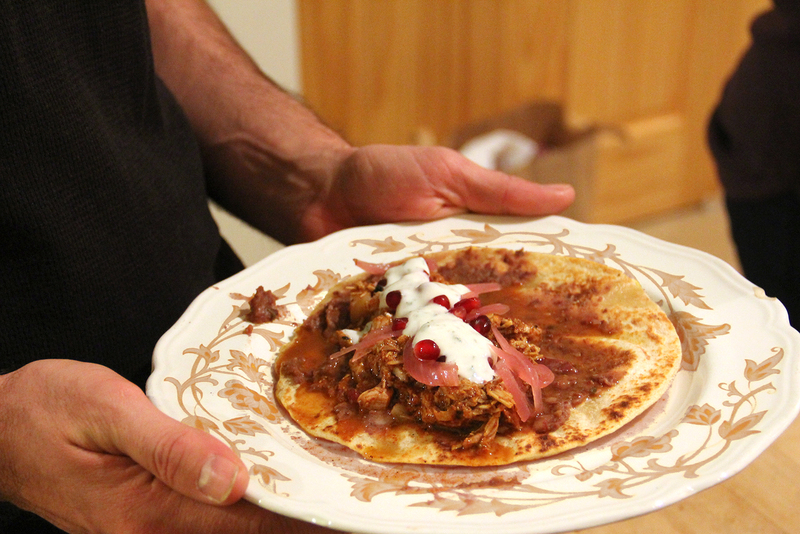 We had a great time preparing the Meso Pibil because Christina and I tried to experiment with flavors that are found in Indian and Arab cooking while using the traditional Mayan recipe from the Mexican Caribbean region. It was really interesting to try adding pomegranate, ginger, and lamb to the original recipe, mixing it with the meat drippings, the achiote, oranges, and banana leaves. Just thinking about these flavors mixed together makes my mouth water. I really had a good time going shopping on Devon Street with Christina to get the ingredients. I remember the smell of curry and other fragrant spices, as well as saris and the storefronts with Asian decorations. Before we bought anything, we went to a Pakistani restaurant and while we were eating we talked with the waiters and cook, who were all from Mexico. As they wisely noted, we would not find pork in that neighborhood for religious reasons, so we decided to buy lamb. Without a doubt, because of our experience of buying ingredients in a cultural environment different from our own, we ended up with a unique dish, which we created by improvising and experimenting with the mix of flavors that we discovered during our walk. Preparar el Meso Pibil fue muy divertido, porque junto con Christina nos atrevimos a experimentar con sabores característicos de la cocina india y árabe en una receta muy antigua de tradición maya de la región del Caribe mexicano. Fue particularmente interesante introducir la granada, el jengibre y el cordero en la receta original y mezclarlo con el jugo del cerdo, el achiote, la naranja y la hoja de plátano. Sólo de recordar el sabor de esta combinación me hace agua la boca. Para mi fue muy divertida la aventura de ir a calle de Devon a comprar los ingredientes necesarios con Christina. Recuerdo el olor a curry y otras fuertes especias, entre telas de saris y fachadas con ornamentos orientales. Antes de comprar cualquier cosa entramos a comer a un restaurante pakistaní y mientras degustábamos los platillos en conversación con el mesero y las cocineras que resultaron originarias de México, se nos ocurrió comprar cordero, pues ellos sabiamente nos hicieron notar que no encontraríamos puerco en aquel barrio por razones religiosas. Sin duda la aventura de conseguir los ingredientes en una cultura distinta a la propia, le dió un nuevo sabor al platillo y nos generó el deseo de improvisar y experimentar con nuevas mezclas a partir de lo que encontramos en el camino. What link to memory does this dish serve for you? Is that memory important? ¿Cuál relación con un recuerdo sirve el platillo para usted? ¿Es el recuerdo importante para usted? As I mentioned before, making this dish is like a special ritual for me. It is a way to commemorate those who have died in the company of my friends. Como mencionaba antes, preparar este platillo tiene una carga ritual muy especial para mi, relacionada con la idea de recordar a mis muertos en compañía de mis amigos. Do you consider this dish authentic? Does the dish’s “authenticity” matter? ¿Considera el nuevo platillo autentico? ¿Es importante la “autenticidad” de los platillos? I think that any time you cook, you are creating something out of the ingredients you have at hand. You’re also influenced by your mood and the environment you’re in, so in that sense every dish is different. For me, preparing and tasting is what is authentic. 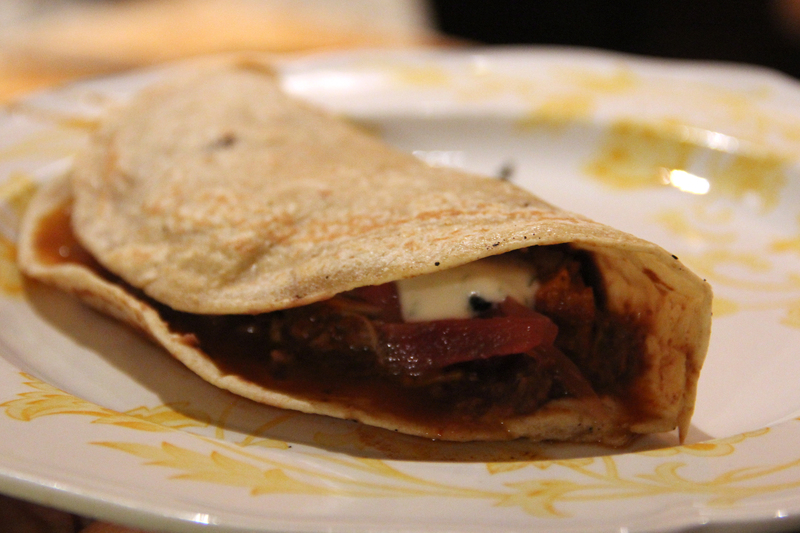 I don’t know if any other cook has tried to make Lamb Pibil Style, but if not, I really recommend trying it. Yo creo que cada vez que alguien cocina inventa con los ingredientes que tiene a la mano. Influye también el estado anímico y el contexto en el que uno está inmerso, en ese sentido cada platillo juega con el tiempo. Para mi el momento de prepararlo y degustarlo lo más auténtico. No tengo idea si algún otro cocinaro haya intentado hacer Cordero al Pibil pero si no, recomiendo ampliamente probarlo. In preparation for our next event, we’re reading about questions of taste, from “Rasquachification” to the unpalatable (and contested) history of pozole. We’ve also picked up this book on 19th-century Chicago recipes to better understand how à la mode around town has changed over the years. More soon! Get your Meso Lotería t-shirt, just in time for spring! We have 100% combed cotton American Apparel shirts in men’s and women’s sizes. $18 includes shipping to anywhere in the US. Let us know if you’re in Chicago and we’ll give you a discount! See the full t-shirt image here. Contact us at mesochicago – at – gmail – dot – com. 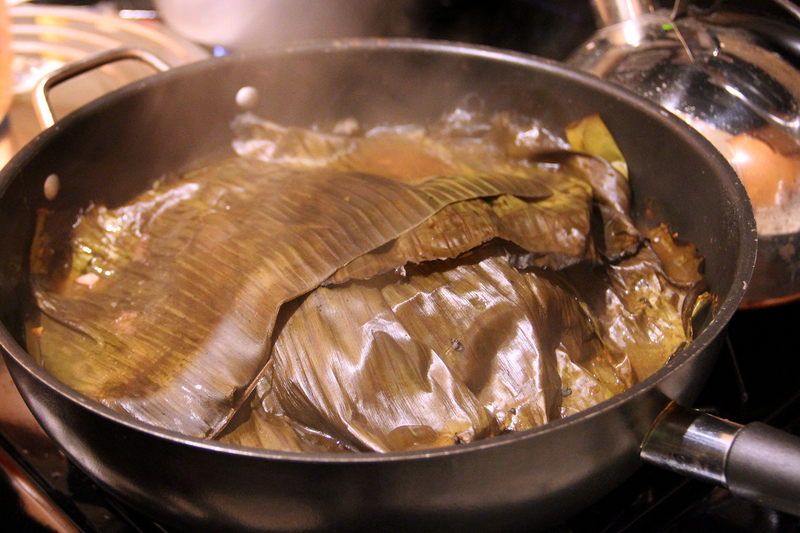 Spicy marinated pork wrapped in banana leaves and steamed in its own juices, the cochinita is traditionally buried in the ground for slow cooking. We recreated the dish in a wok on our Hyde Park stove. 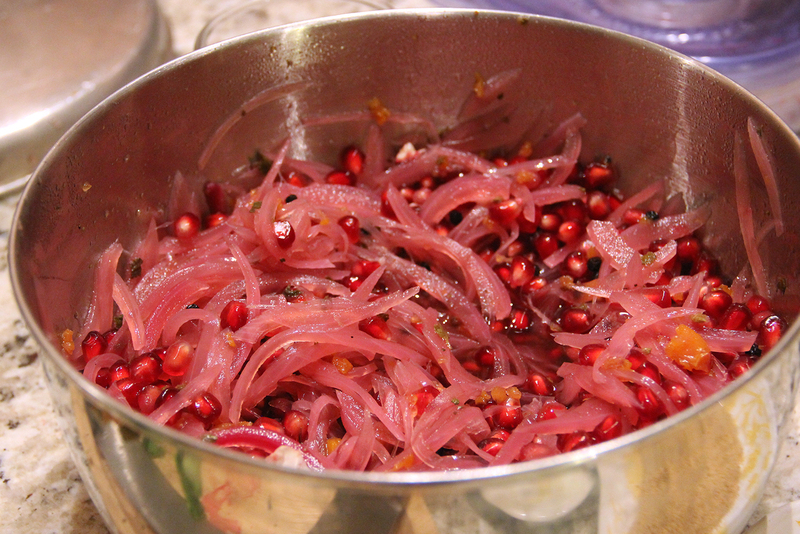 We added Andhra-style lime pickle and ginger to the marinade, and served the final dish with a chutney made of pomegranate seeds and pickled red onions. 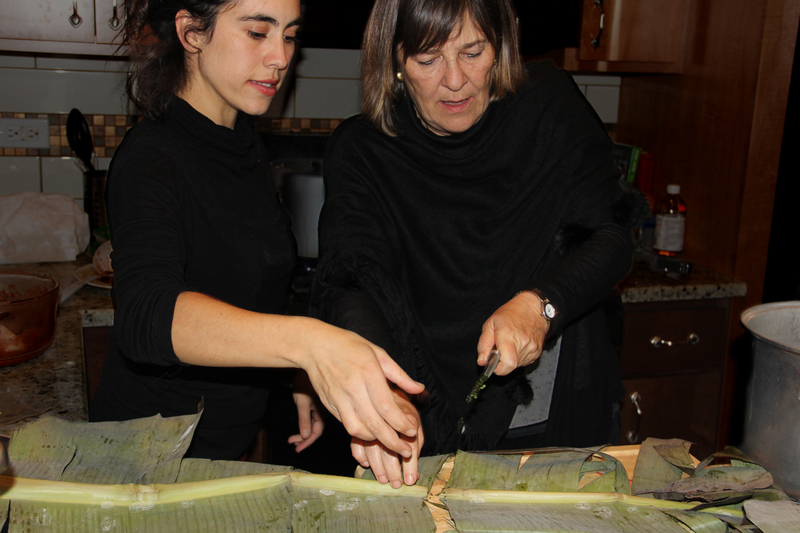 Making this dish with Nuria was a powerful experience. 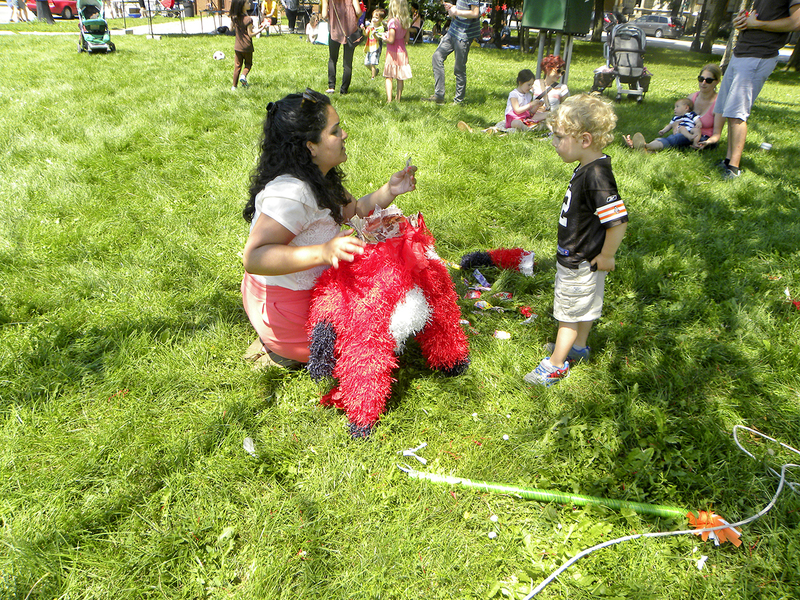 She generously shared her memories with us, along with her artwork and joyful energy. She also spoke about the missing students from Iguala, who had recently been kidnapped and murdered, with their remains burned. It’s strange how preparing food with another person can conjure so many emotions. Cooking this meal with Nuria and sharing it with friends and family gave us the chance to celebrate and equally to mourn. 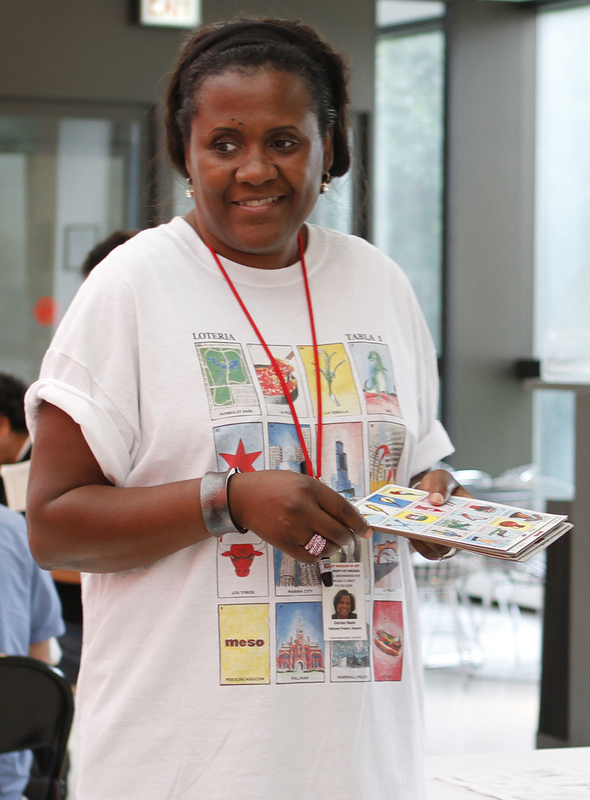 Join us for Lotería and delicious new recipes at the Smart Museum of Art, University of Chicago, on Thursday, August 21! 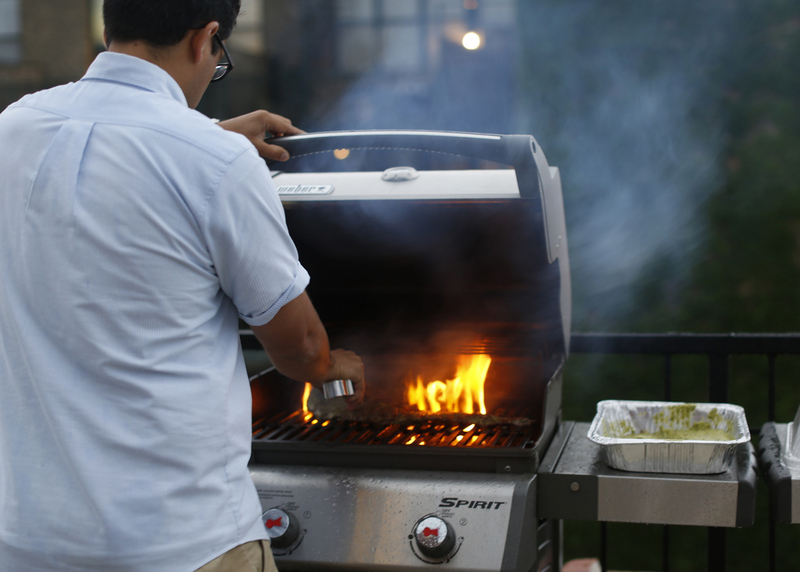 5550 South Greenwood Avenue, Chicago, IL, 5:30-7:30 p.m.
We’re grilling sweet corn for Chicago-style elote, whipping up a tomatillo-ranch dressing, and having chips and salsa made with plants harvested from the Avant Garden next door to the Smart. 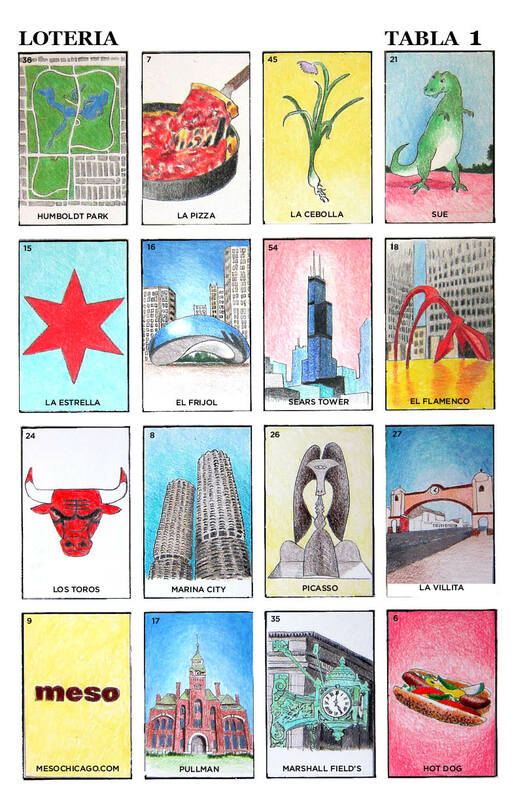 Plus, make your own lotería cards based on art in the Smart’s collection. 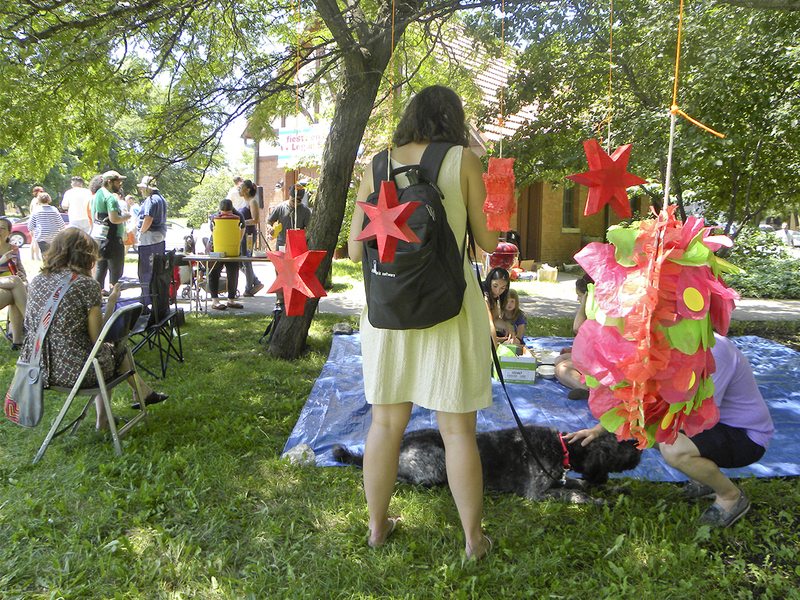 We have so many people to thank for helping us put together Sunday’s event at Comfort Station–friends, family, businesses, community members, stakeholders of Logan Square. Our gratitude is difficult to express. It was a beautiful day. 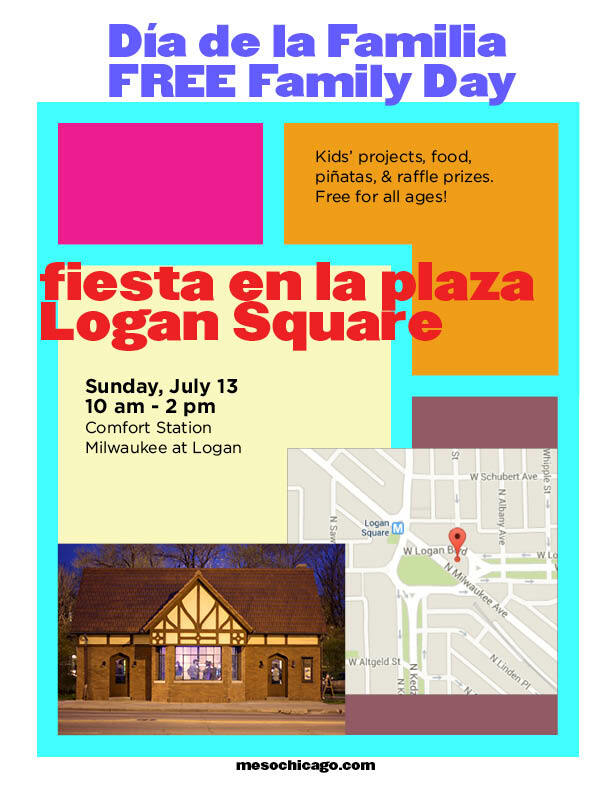 Join us for a free family day! Comfort Station, Milwaukee Ave. at Logan Blvd. 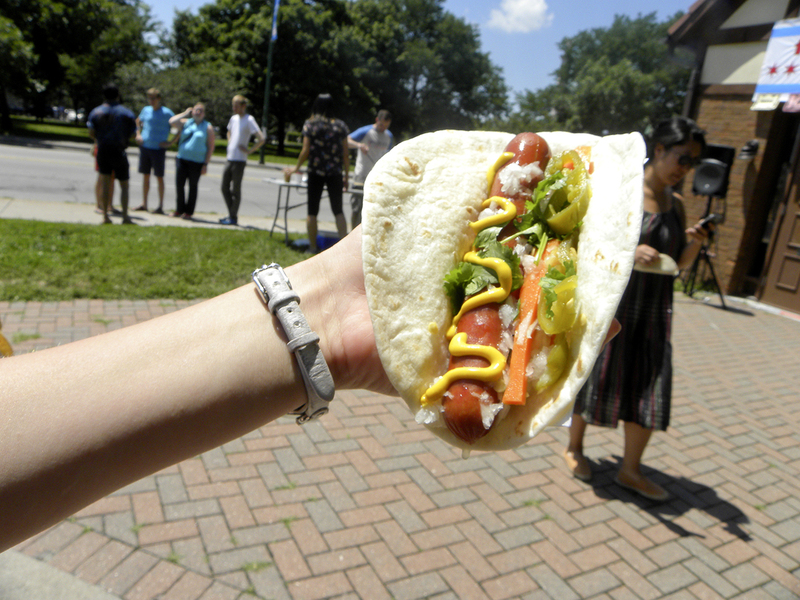 Enjoy grilled hot dogs and veggies from the Logan Square farmer’s market, and fresh tortillas. 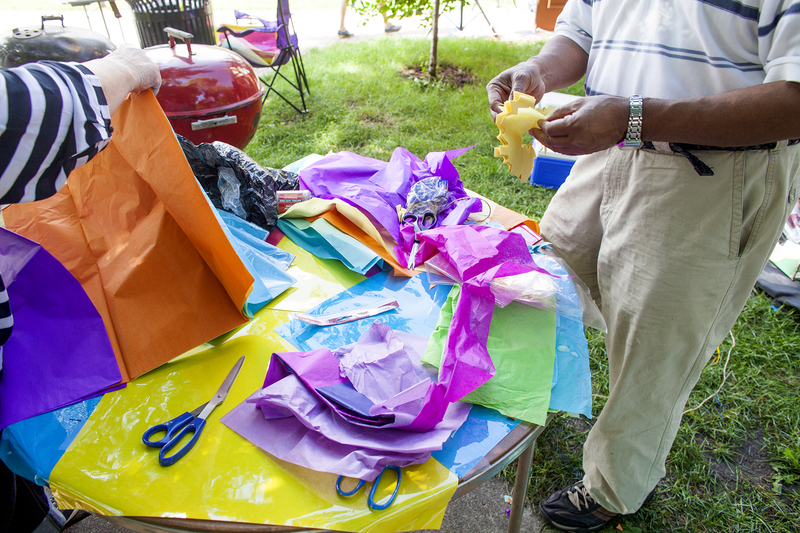 Take a swing at the community piñata, and make a papel picado with us to enter our raffle for awesome prizes. 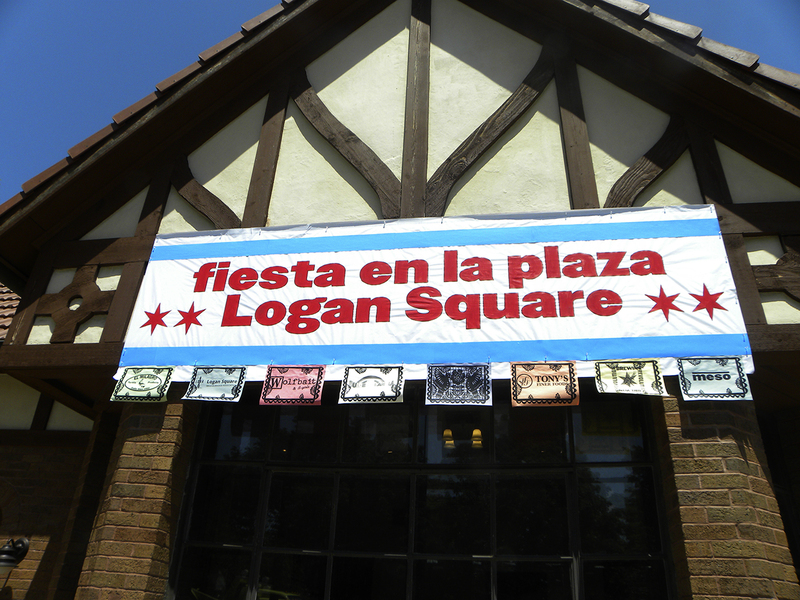 This event is generously supported by Comfort Station, Logan Square Neighborhood Association, Alderman Rey Colón, Revolution Brewery, El Milagro, Tumbao, Dulcelandia, Wolfbait, and Tony’s Finer Food. To prepare the steak, combine all marinade ingredients in blender. Once blended, use marinade to cover steak in a large pan. Let sit for 24 hours. Heat grill to highest setting. Grill for 6-8 minutes per side. Once done, cut against the grain into strips. To prepare the pickled vegetables, blanch the carrots for 1 minute and rinse in cool water. 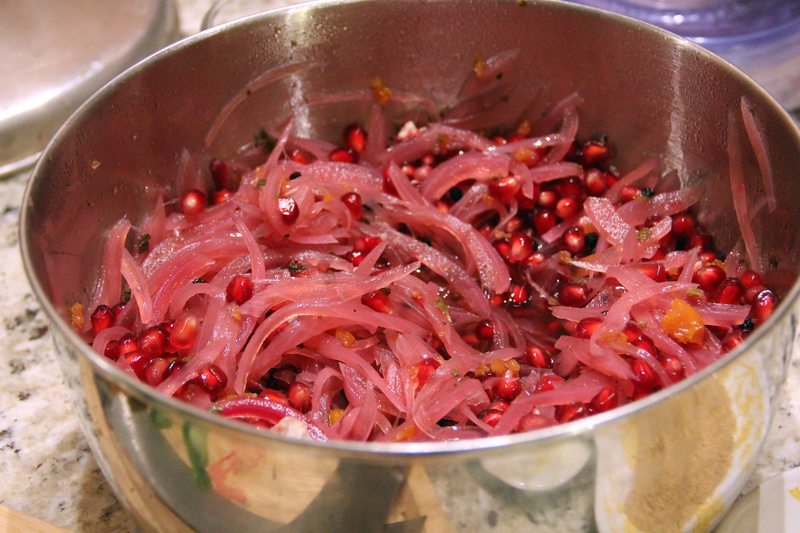 Place them in a heat-proof jar with the crushed garlic cloves, jalapeños, fennel, peppercorns, and anise. Bring, water, vinegar sugar, and salt to a boil, then reduce heat and simmer for two minutes. Pour over the vegetables in the jar. Allow to cool and then cover and refrigerate. Turn jar upside-down once or twice a day. Pickles will be ready within two days. To prepare the bánh mìn, use fresh bolillos and slice lengthwise. Cover generously with mayo, and add steak, pickled vegetables, and fresh cilantro, garnishing with cabbage and radishes to taste. Serves 10. Thanks, as always, to our taste-testers and collaborators, many of whom brought fantastic food and recipes to our potluck event. We will post more soon. Photos by Christopher Sonny Martinez. Mark your calendars and stay tuned for more information about this very special event.